Tina's Crop Shop: Growing In Unity Post #2 - Holy Cow! 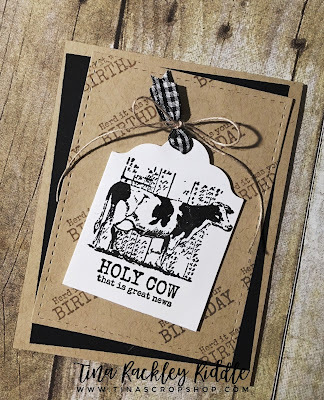 Wow...so beautiful cow card,your friend will love it. Omgosh!!! Love this cutie pie!! I “herd” they are having a sale too! Very cute! Love the layout! Tina your cow card is adorable! Your friend will love it! Thanks so much Deba! :) I think she will too! I'm loving this GIU Gal stuff.. I'm getting so many cards made using stamp sets that I had intended to use. So much fun! Love the card and it’s simplicity, but still has a classy look! Very cute! Black and kraft look so good together-especially with this stamp. Thank you! I love kraft with black as well! I love the ribbon and twine together. I love when cards go together quickly but look this fabulous. Thanks so much Denise! I agree.. I love cards that are fairly simple but still look great! Cute. Cows are awesome. I like the kraft paper, also. Great use of a tag. Thank you Katy! I love kraft and tend to use it a lot! Your friend is going to love this card! This is one stamp set I keep eyeing. Great inspiration! Thanks so much! I think she will too! I'm so glad I finally got the chance to make it for her! That's a really cute stamp & sentiment! I love the kraft and also the background you created. Love your card! Your friend will love the card. The black and white on the kraft really pops! Thanks for sharing your talents with us. Thanks so much! I appreciate you stopping by and taking the time to comment! Thanks so much! I appreciate your sweet comments! This card made me giggle! How CUTE! Love the background you created! Fun card! My daughter loves cows, this would be a nice card to make for her. Love the repetitive stamping you did to create you background. What a great card! Oh gosh, I’ve been thinking about getting this one. I love your card!! Love the cow; this makes me smile!!! What a fun card!!. Must get this stamp set lol can't believe that I dont have. Love this fun card. Looks great in kraft and with the gingham ribbon. Super fun card! Jazzy but with a down-home appeal! Aww so cute! This make me think of my great grandmother <3 She raised calf in Washington. I like the stitched background layer, your friend will love her card. Great card! I love the clean and simple look along with the tag and multiple ribbons/twines. The picture, the card stock, the ribbon and twine are all perfect for this adorable cow image1 And I love the birthday sentiment! I love the black and white with the kraft paper. Great card! That’s such a great card ! I love that cow stamp !